Warner Brothers Television's set designers are faithful customers of ours! This curtain and matching chandelier were purchased from us for their sets. This awesome new beaded curtain has a ton of fun color: 4 different shades of Blues ranging from aquamarine to a dark greyish-blue AS WELL AS some strands of Lime thrown in for great contrast. Would look FABULOUS with one of our new tie-dye canopies! This curtain measures 35" x 72" and has 34 NON-Iridescent strands of beads (no pearlized coating)...the beads are see-through and have little disco-ball type of faceting. Modified just to my liking! This is a wonderful beaded curtain with just the right size beads in beautiful colors. The only thing I did not care for was the blue plastic headrail that came with it. The bead strands are too far apart and because they are stationary, there was no option to slide all the bead strands over to one side. 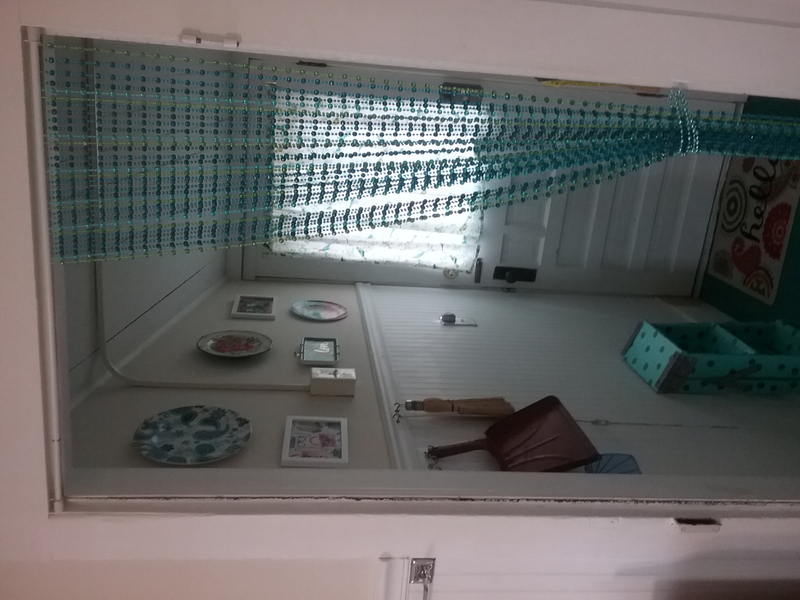 I wanted to use the curtain for "show" to separate the kitchen from my laundry room without having to physically move it each time I passed through (see photo). So, to remedy this I removed each strand of beads and guided them onto a tension rod that I had removed the coil spring from. Then I hung it up with cup hooks screwed into the door frame. Now there is room to add more bead strands if I ever wish, too! I just love the colors! I bought an additional curtain to add. It looks amazing when you have 3 combined!! Very impressed with quality of the bead strands and rod. Looks great in my daughters room! I bought three variations of beaded curtains from this site. 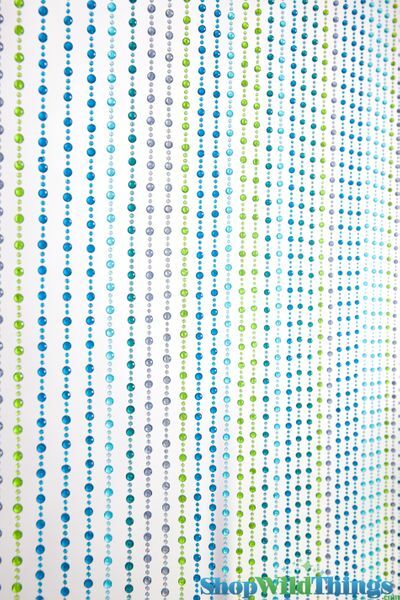 This was my number two option behind Gemstone Beaded Curtain - Green Blue Non-Iridescent - 3 ft x 6 ft. Same quality, just different colors and I preferred the gemstone tones. These are well made. Shipment was fast. Perfect. This was purchased with mini chandelier . It was perfect for the look she wanted for her room. We loved both products and very easy to hang. Bought this for my 11 yr old daughter. She absolutely loved it! I was very pleased with quality of the beads. Easy assembly; fit right over door. Delivery was fast too ...especially during Christmas. I will definitely buy from this website again. ProsThe quality of the beads. They sparkle nicely in the light. I love it! the beads aren't real close together sideways so it lets light in, and that is what I wanted. It hangs at an entrance to a laundry room that has a window. It helps to breakup just looking into the laundry room when one walks by and instead you see the colored beads. ProsIt doesn't snag when one walks through it, very fluid. ConsNot long enough, but I didn't realize I had to hang it higher above the door top so one couldn't see the blue plastic hanging rod. If I'd had some idea I would have ordered it longer. Product was great but slow delivery. Daughter loves the product. I was not happy with delivery. Shipping chart said 2 - 3 days but it took 8 and was delivered after Christmas. Would definitely by from this website again. ConsWish there was a different type of mount. It hangs by hooks but I wish it was flush to the door casing. The ultimate test was how well my grand-daughter liked it - and it was a big hit!!! So this curtain gets an A+! My granddaughter is getting a new bedroom and she wanted beadad curtains instead of doors for her closet. After looking all over town for them with no luck I found your website. How lucky was I to find a great selection of curtains but also the exact color she wanted. I was thrilled and she went wild over them. Now we are going to order the matching light fixture for her too. ProsThe color and size were perfect and they were delivered when promised. No hassles. ConsThe only thing I would change is that because they are being used as a closet door I would have liked them to be a little denser( have a few more strings of beads) Otherwise they were perfect. I purchased these as a surprise for my daughter. We are updating her room (she is a tween) and she loves the look. We used some for the door and split another one up to hang with her window curtains. Looks great! ProsMatches all the other accessories in her room. Is made well and easy to hang.